Amie Siegel, RM # 1-21, 2014, Suite of 21 chromogenic color prints, Dimensions variable, Installation photo: Wayne McCall, Courtesy Ratio 3, San Francisco and Simon Preston Gallery, New York. For the past decade and a half, American artist Amie Siegel has worked between film, installation, photography and performance, rigorously questioning the tropes of cinematic forms. 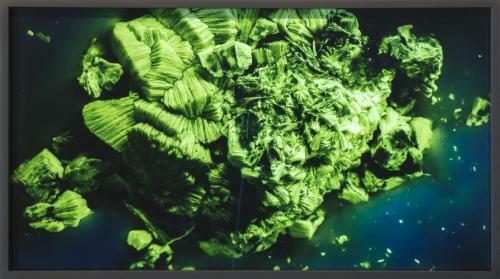 The artist will discuss her photographic series RM, using radioactive elements, her large scale and live moving image performance work Winter (2013), shot in a post-cataclysmic New Zealand and Quarry (2015), a recent video tracing elemental materials from the world’s largest underground marble quarry to its deployment in high-end luxury Manhattan real estate. Siegel’s expansive works, in their accumulative, cinematic modes, ask a broad set of questions that peel back and advance time, slowly reveal representations of economic, environmental and political cycles. Siegel’s work has been featured in recent solo exhibitions at the Metropolitan Museum of Art, New York, Kunstmuseum Stuttgart; Villa Stuck, Munich and the MAK, Vienna. She has participated in group exhibitions at the Whitney Museum of American Art, New York; Hayward Gallery, London; KW Institute for Contemporary Art, Berlin; CCA Wattis, San Francisco; MoMA PS1, New York; MAXXI Museum, Rome; Haus der Kulturen der Welt, Berlin and the Walker Art Center, Minneapolis. Her films have screened at the Cannes, Berlin, Toronto and New York Film Festivals, The Museum of Modern Art, New York and The National Gallery of Art, Washington, D.C. Siegel has been a fellow of the DAAD Berliner-Künstlerprogramm and the Guggenheim Foundation, the Fulton Fellow at The Film Study Center at Harvard University, a recipient of the ICA Boston’s Foster Prize, a 2012 Sundance Institute award, the 2014 Forum Expanded award at the Berlin Film Festival and a 2015 Creative Capital Award. She lives and works in New York City.